Built from Massive dead standing timbers harvested from Yellow Stone Park area, this upscale cabin is minutes from adventure. Kindle your spirit in front of the gas fireplaces or the fire pit. The soothing hot tub awaits. A warm welcome to our mountain getaway, Red Lantern Lodge. Enjoy the tranquility of our three-bedroom/two-bath cabin from your front porch rocker with a breathtaking mountain view. 3 Bedrooms & 2.5 Baths: The Master Bedroom Upstairs has a gas fireplace, private bath and king bed. The second bedroom on main floor has a King bed. The third bedroom downstairs has a Twin over queen bunk bed along with a second queen bed. 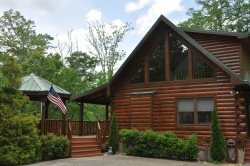 The peaceful sounds of nature set the tone for your Western North Carolina mountain cabin rental vacation, just south of Sylva and Dillsboro, North Carolina. Whether sitting in front of a warm fire, or taking in the cool mountain air on one of three decks overlooking the surrounding mountains, Red Lantern Lodge is your home away from home. Secluded, quiet and peaceful on several acres of wooded and Mountain views. Relax and enjoy the fireplace and expansive porch and deck. Fantastic for honeymoons, anniversaries, or just simply to get away. A large cabin with simple elegance in a mountain setting. For guest reviews, please click on the Reviews Tab. Maximum capacity of up to 9 is based on county guidelines. Thank you so much for allowing my family and I to enjoy this beautiful cabin. The kids loved it, we are sad to be leaving today. We are happy to carry this memory with us forever. This was the perfect stay! The cabin is amazing! We all enjoyed it so very much. the kids love the nature all around them. We want to come back so much. Thank you for all of it. The staff was very friendly. I received a phone call on check in day to make sure I found the house and didn't have issues getting in. This house was fantastic. We had plenty of room for the 8 of us. We had no issues using our GPS to locate our house. We had everything we needed. Once we had our food and beverage, we didn't need to leave.Annual Snowboarding trip and Birthday celebration.The view was great and the pool table and hot tub were a bonus. We cam for our annual snowboarding trip. I am having 4 celebrations this month for my 40th Birthday and the 1st one was about 5 of my friends. We enjoyed the home which afforded us plenty of space, quiet time, and fun. I would like to come back in the spring and go fishing. The cabin exceeded my expectations, it had everything we needed except food. I enjoyed sitting on the patios enjoying the views as well as enjoying the hot tub at night viewing the stars, which was the perfect temperature as well! The people at GSCR were quick to respond to me and answered any questions that I had. Amazing cabin! I loved the views, the layout and the Hot Tub! My friends and I enjoyed my birthday party! We loved the cabin, it was beautiful. The view is gorgeous and the property is well maintained. Lots of pillows and towels. We came to go Christmas tree shopping. Beautiful, authentic real wood cabin. Beautiful view. Very comfortable. The cabin had everything we needed for our stay. We enjoyed the hot tub, pool table and chiminea. We enjoyed our times sitting on the decks just enjoying the views. The kitchen came equipped with everything we needed. The view was absolutely beautiful. It was so enjoyable to just sit on the deck(s), look at the view, listen to the birds and unwind. Our family thoroughly enjoyed our stay in this beautiful cabin. It was cabin was everything we could have wished for. Thank you so much for sharing it with us! We had a great family vacation. We had the most wonderful stay. This place is amazing and so breath taking. Our favorite thing to do is cook out doors and enjoy the view, we couldn't get enough. By far, the greatest stay ever. The property was a pleasant surprise & an excellent value. We had an amazing time in the area, and found plenty to keep our family busy and entertained. The pictures on the website were good, and there were plenty of them. BUT, they did not do justice to how great the house was for us. It far exceeded our expectations in terms of upkeep, size, location, etc. We went rafting on the Tuckasegee, played golf at Sequoya National, played disc golf in Asheville, went zip-lining, went on a couple hikes in the National Park, and generally enjoyed touring the area. We loved our stay in your beautiful mountain home. Our grandsons spotted 2 little rabbits on our walks down the driveway. They loved mountain living. This place is a gem. I wish we had more time. Lovely ever-changing views. We hope to visit again! We had an absolutely amazing stay at The Red Lantern Lodgewe celebrated our youngest daughters graduation from Western Carolina University on Saturday and Mothers Day on Sunday. We had family that joined us all the way from Wisconsin and family memories were made the whole weekend. What a cabin!! All the amenities and surrounding beauty a woman on the cusp of 30 so desires. The Hot Tub was the hottest hit. What a beautiful cabin for our weekend getaway with the family! It was a perfect setting and location to reconnect with loved ones! Thank you for the clean, cozy space with gorgeous decor! Three generations enjoyed a weekend getaway at this cozy cabin. The amenities were great. The kids loved the hot tub while the parents grilled out and set by the fire. We will definitely plan another weekend getaway! I rented this property for myself and a group of friends. We were all so impressed! There was plenty of room for everyone to have their own space, the cabin was beautiful, and it was close to lots of great hiking and waterfalls. The view from the porch was incredible and you were truly in the mountains just walking out the front door. We loved the hot tub and the large porches. My friends and I loved this cabin! Everything was gorgeous and well kept. We had everything we needed to make several meals and there were plenty of things to do. We all wished we had more time than just a weekend. The driveway up to the cabin is intimidating but we got all 4 of our cars up fine even without 4 wheel drive. The view from the porch and hot tub is gorgeous and makes you feel so secluded. Great smoky national park was about a 30 min drive and easily accessible for hikes and waterfalls. Would definitely recommend and rent this cabin again! The property had excellent views of the mountains and excellent amenities. The cabin was decorated for Christmas and gave us the feeling of being at home. It exceeded our expectations! The cabin was fantastic. Down to every detail. Really- thanks. We are already talking about doing it again next year. The view was amazing. It was like staying in a dream house. The staff was exceptionally helpful. This cabin was a perfect destination for our family's holiday getaway. We were looking forward to this trip for months and did not disappoint. We loved the rustic but clean cabin feel. Also, the cabin had enough space for everyone to do their own thing. Thanks for sharing! Red Lantern Lodge is Convenient to local activities -- for local gems, just let us know your interests and we'll be happy to help you.